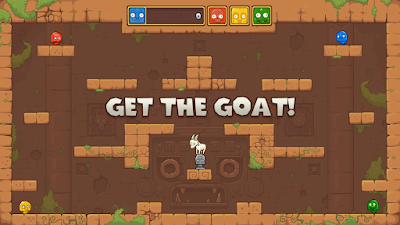 We continue this month with a new 2D platformer. Those aren't scarce on Nintendo systems by any means, but it's a fun genre all the same. 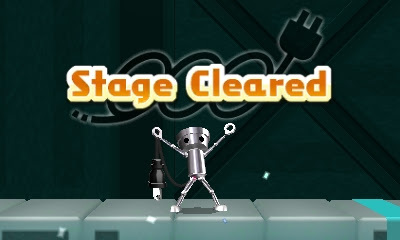 This time it's Chibi-Robo's turn to star in one with Chibi-Robo! : Zip Lash! Chibi-Robo! is a franchise that is quite under-served, not just by gamers and consumers, but also a bit by Nintendo. His first game appeared on the GameCube, and it was a cult classic, although sales were less than stellar. Despite this, Nintendo continued with the series, though putting the chrome dome hero onto the Nintendo DS, which in North America was exclusive to Walmart stores of all places. Following that was a Photo Finder game on the Nintendo 3DS, which didn't feel up to snuff by any stretch of the imagination. 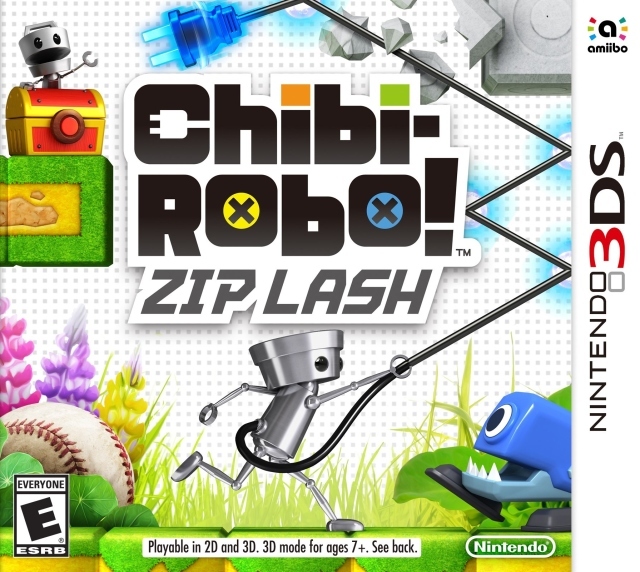 Now, with what seems to be Chibi-Robo's final chance in the spotlight, he arrives in retail form on the 3DS with Chibi-Robo! : Zip Lash. Even if Nintendo unplugs the franchise and titular character, at least it's with a game that is actually quite good. Swing it around, then bring this foe down! Chibi-Robo! : Zip Lash may seem like a typical 2D platformer, but the mechanics make the game quite more interesting than the average game. Fans of the series known of our chrome dome hero's plug that is attached to his rear. 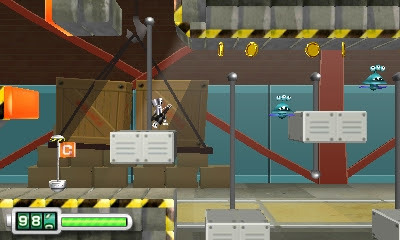 Not only can he plug into outlets to restore watts (the lifeblood of Chibi-Robo-- if he has no watts left to use, it's game over), but he can use it to attack enemies by lashing it at them, he can use it to grab items, and he can hook onto orange tiles and pull himself up ledges or through otherwise impossible-to-pass areas. Grab and pull yourself to these orange tiles with Chibi-Robo's whip. With the eponymous Zip Lash technique, you can use Chibi-Robo to have his plug reach further distances. Collecting red and blue orbs makes his Zip Lash move reach farther out. Levels are specifically designed to take advantage of the fact that Chibi begins each one with the minimum Zip Lash distance. Otherwise you'd be able to skip huge parts of levels if the Zip Lash amount was cumulative. Having a large range with Chibi-Robo's Zip Lash technique allows him to throw it into walls, having it bank off them at an angle to reach out-of-the-way objects, items, enemies, and orange tiles. Aim your Zip Lash to bank it off this wall to reach this orange tile. Then you can pull yourself across these two chasms. There is an ample amount of checkpoints in each level of Chibi-Robo! 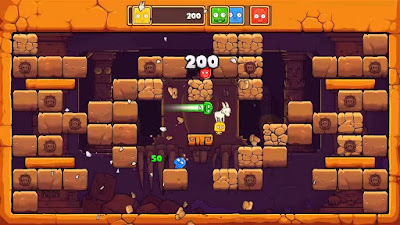 : Zip Lash, allowing players both skilled and beginner to enjoy the game. Falling into a chasm results in returning to the last passed checkpoint while running out of batteries through enemy hits, falling into holes, and just the general passage of time means you have to restart the level from the beginning. Two items can be purchased from our hero's Chibi House: one restores an empty battery while the other propels Chibi-Robo out of holes he has fallen into. 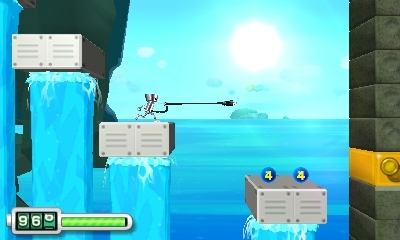 Careful, Chibi-Robo-- water and electronics don't mix! 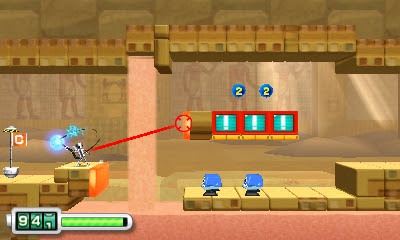 There are six main worlds in Chibi-Robo! : Zip Lash, and each consists of six levels. The way about selecting a level is an overly gimmicky manner, the Destination Wheel. After beating the first level of a world, you get up to three spins on the Wheel that decides how many levels you move past. 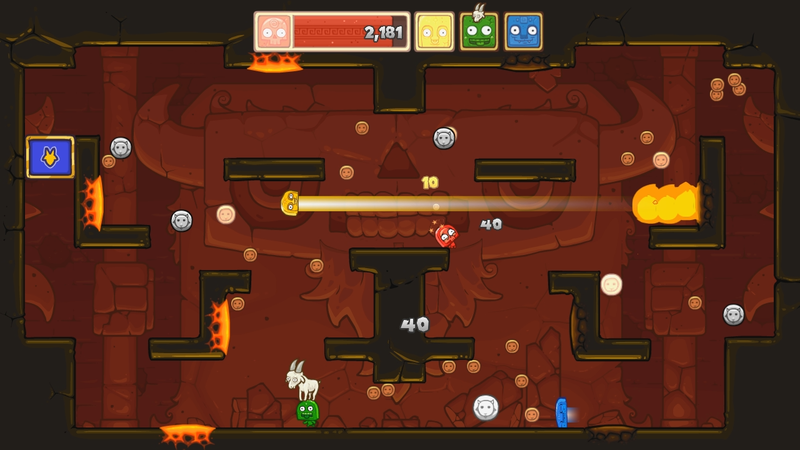 For instance, if you roll a three and you're on level 1-6, you'll skip levels 1-1, 1-2, and go to 1-3, as the level selection is a circle itself. Now, you can easily buy panels to place on the Destination Wheel to put the odds better in your favor, but it's also incredibly easy to get the spin you want. All you need to do is press the stop button as soon as the Wheel is on top of the number of levels you want to move, so if the Wheel is on "1" when you stop the Wheel, it'll usually end up landing on "1". That said, since it's so easy to cheese the Wheel into giving you the correct level you want (I personally made it my goal to play the levels in order, so I always spun a "1"), what is even the point of the Destination Wheel in the first place, other than just to annoy some players? Getting stuck playing a level you've already completed because of a bad spin is not innovative. It's just stupid. 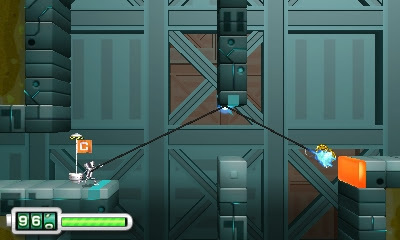 Levels in Chibi-Robo! : Zip Lash feature a wide variety of different mechanics in them. Each level generally uses one concept which is slowly but surely expanded, starting out simple and ending with something more complex and/or challenging. 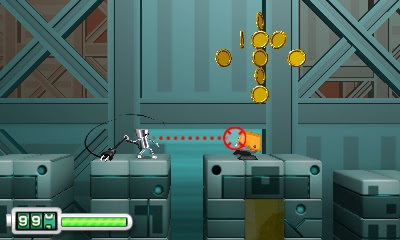 From using the power of a fire outlet to set Chibi-Robo on fire to rush through levels, melting metal blocks, to racing on conveyor belts and slippery icy floors, Zip Lash has plenty of variety to keep players coming back for more. Nothing like a fling in the forest to recharge one's batteries! Oh, metaphorically speaking, of course. 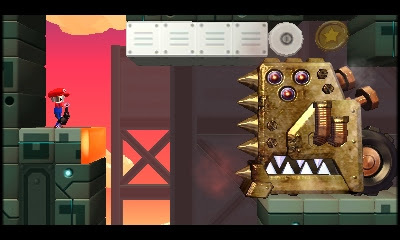 Most levels follow traditional 2D platformer fare, but one level in each world is a vehicle-based level. These put Chibi-Robo in control (or lack thereof as it can feel at times) of one of three vehicles such as a rocket powered skateboard or a hot air balloon and charge him with avoiding enemies while keeping his quickly depleting battery power charged. The controls for the hot air balloon take some getting used to, and later vehicle stages become a real challenge. However, it's never unmanageable, and dare I say, I enjoyed these sections for the spice of variety they gave. 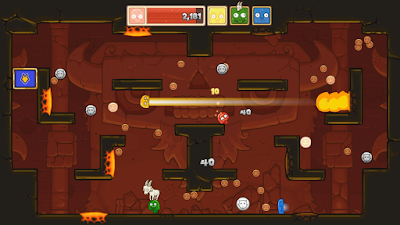 Each level comes with a selection of collectibles to go after for more proficient players. 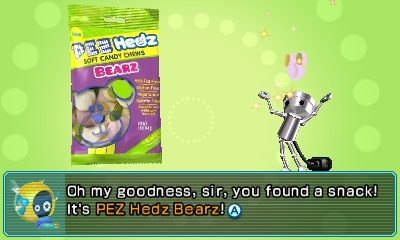 These include three star coins, three Chibi-Tot robots that wish for Chibi-Robo to catch them (if he can), and several snacks, usually found in bonus rooms and inside treasure chests. Finding these is very rewarding, as it shows off the creativity and cleverness of the level design-- much more than if you just run through a level to just reach the end. to places, well, (since he's so tiny) big and bigger! The snacks in Zip Lash are real world candies, pretzels, crackers, and potato chips from all around the world. When one of these is properly delivered to one of the six toy characters in the game, information about these are given. Despite Zip Lash lacking dialogue for the most part, the sections where the toys offer their wisdom are some very funny or at least very cute exchanges, showing the Nintendo Treehouse localization team know their stuff and can tickle some funny bones. Why does this game have to make me so hungry? 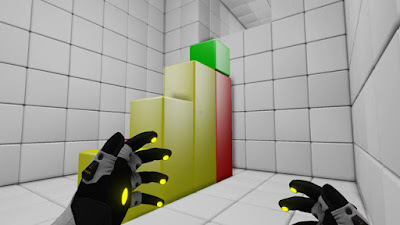 Returning to levels is not only recommended for getting loose collectibles, but a lost alien will be loose in some area (except in vehicle levels, of course). Taking this alien and placing it inside its UFO will allow you the chance of earning a new costume. Maybe you can even unlock some Nintendo-related ones! While you can interact with users on Miiverse to piece together parts of codes to unlock new costumes, all of the codes are available online on, say, a message board, so you can simply input them in Chibi-Robo's house's computer, rescue and return the alien to its UFO, and get a costume without all the fuss of figuring out what the codes are for yourself (or hoping you luck out and get a costume by pure chance through the natural method). 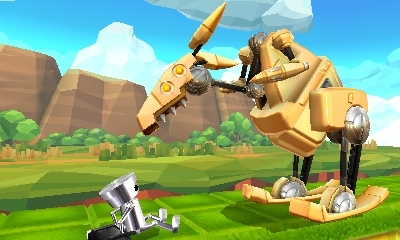 Hmm, Chibi-Robo... you certainly remind me of someone. 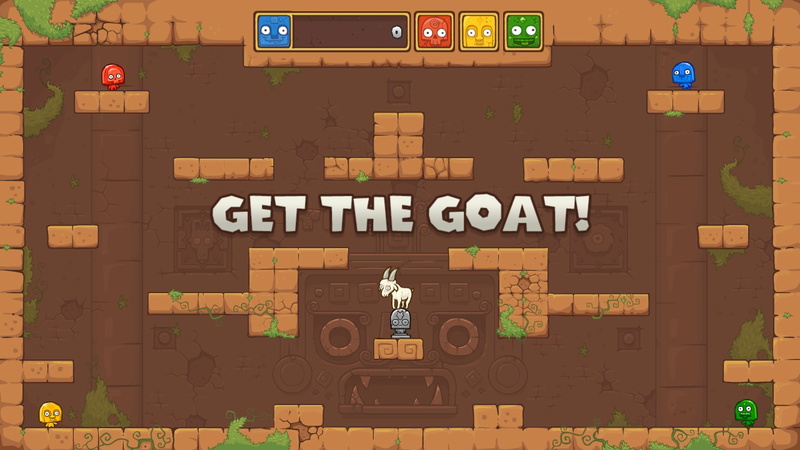 When all six levels of a world have been completed, it's time to take on a boss! These encounters start off innocently enough, but then they really utilize Zip Lash's mechanics in some truly remarkable and clever ways. 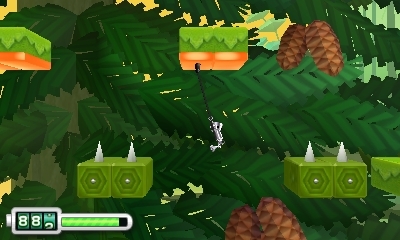 You'll anchor Chibi-Robo to an orange tile just to avoid being sucked up an alien spacecraft, for instance. The boss battles are a lot of fun and add even more value to this incredible 2D platforming offering. And a "howdy-do" to you, too, Robo-Roo! Chibi-Robo! : Zip Lash offers some lovely sights and sounds. 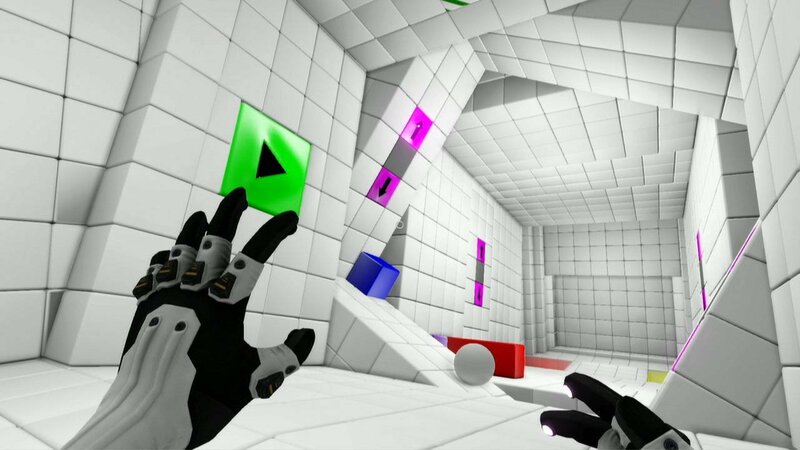 The visuals are all 3D, and they look really nice with the 3D slider up. 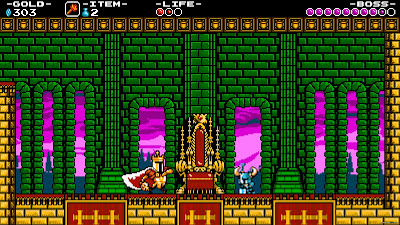 However, on some occasions there is an inexplicable frame-rate dip here and there, usually in rooms with a lot of enemies at once. On the sound side, the music is suitably catchy for the most part, offering synth instruments and lovely arrangements. I'm at a loss for words as to why Chibi-Robo! : Zip Lash is receiving such a... well... backlash from some. It's a highly original and competent 2D platformer with wonderful level design, plenty of content to keep players coming back for more, and charming characters, both good and "evil". Things like the fact that 2D platformers are no stranger to Nintendo platforms, some of the vehicle sections, and that darned Destination Wheel do detract from the delightful quality of the game, but overall, Chibi-Robo! : Zip Lash does indeed lash, zip, and whip it good. It's Columbus Day in the United States, but rather than celebrate a total scumbag of a human being that the U.S. celebrates for no other reason than tradition, we'll be celebrating Indigenous People's Day here at SuperPhillip Central. In fact, we'll be celebrating indies this edition of SuperPhillip Central's Favorite VGMs. 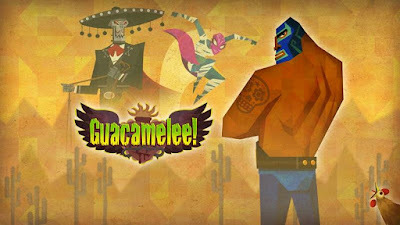 Such indie games being celebrated this week include the great Shovel Knight, the co-op fun of Castle Crashers, the Sega-like Freedom Planet, the first-person fun of Lovely Planet, and finally, the Metroid-like Guacamelee! If you want to check out past VGM volumes, look no further than the VGM Database. That said, let's get on to the music from games from indie/independent developers! 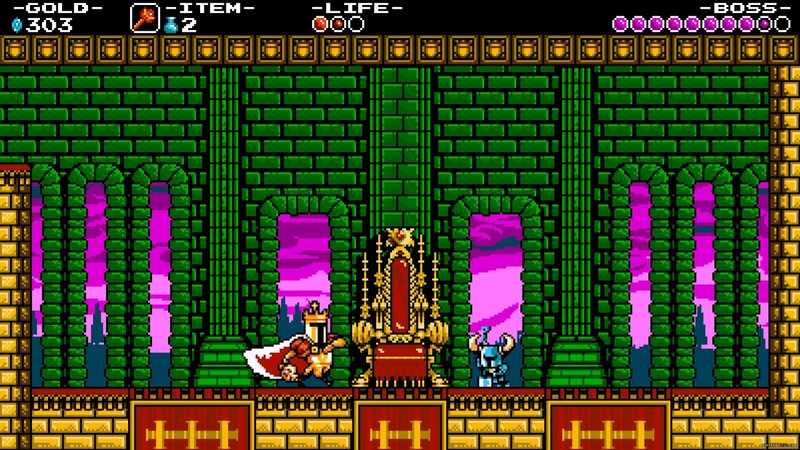 The theme for King Knight's stage, one of the first players encounter within the critically acclaimed (including by SuperPhillip Central) Shovel Knight, this catchy theme by Jake "Virt" Kaufman and Mega Man composer Manami Matsumae gets you in the mood to run and dig through a golden castle. 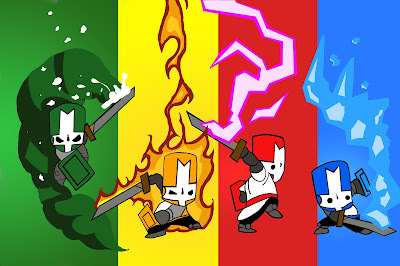 Speaking of catchy music, there are none more catchier than Castle Crashers' Forest Entrance theme. 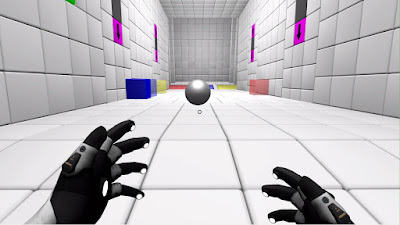 Do battle with up to three other friends as you beat foes into oblivion. Castle Crashers is available on Xbox One, Xbox 360, PlayStation 3, and PC. Hopefully one day Nintendo systems will get this game, but maybe that's wishful thinking. Freedom Planet is one of Bean and my favorite digital games of the year. It released this month on the Wii U eShop after many months (maybe years?) of waiting. 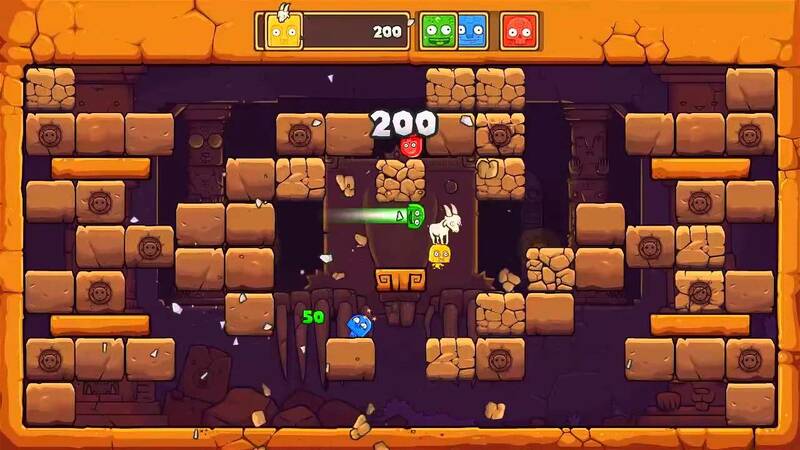 Relic Maze 2 is another memorable ditty from the soundtrack, and it hearkens back to old school platformers, the kind that Freedom Planet is happily and merrily based on. 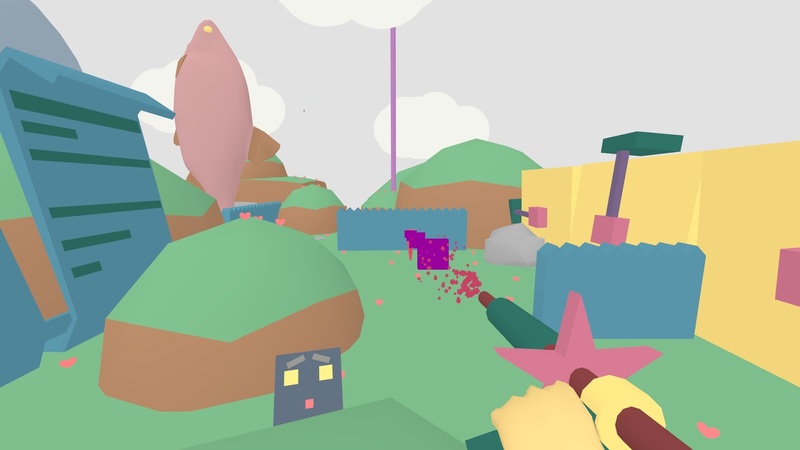 From one planet to another, Lovely Planet is an upcoming Wii U eShop game that has you in first-person mode shooting and dodging targets. The soundtrack is all composed by Calum Bowen, and you can download the soundtrack from his Bandcamp profile. Support the composer! Clap your hands! Wait, you don't have the time to do that when your hands should be pressed against a controller, taking on a big bad boss! Well, at least you can bob your head in time to the music, right? Guacamelee! is a Metroid-styled 2D platformer that has great combat that incorporates the abilities you learn into battle.